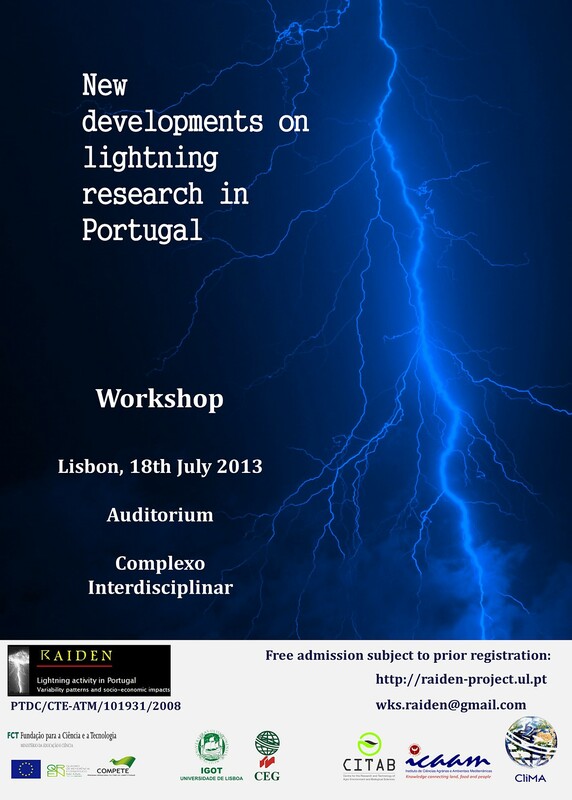 The workshop is framed within the Raiden project, a project devoted to the assessment of thunderstorm activity in Portugal, its spatial patterns and temporal rhythms, as well as the lightning-related impacts on society. It will be held at the “Instituto para a Investigação Interdisciplinar” – University of Lisbon and organized by CLiMA (Research Group on Climate and Environmental Changes /CEG/IGOT). Participation is subject to the available places. 2010-2013 - Project “Lightning activity in Portugal: variability patterns and socio-economic impacts” (RAIDEN/ PTDC/CTE-ATM/101931/2008) – On this project collaborates the Centre for Geographical Studies (University of Lisbon, principal institution), the Centre for the Research and Technology of Agro-Environment and Biological Sciences (University of Trás-os-Montes e Alto Douro) and the Institute of Mediterranean Agricultural Sciences (University of Évora). The project is coordinated by Marcelo Fragoso (CliMA, CEG-UL). The research on this project aims to produce a climatology of thunderstorms activity in Portugal, developing the investigation on spatial patterns and temporal rhythms of lightning activity, considering different time scales, namely the interannual, seasonal and and diurnal cycles. Among other relevant issues of research, the RAIDEN project is also focused on the assessment of lightning related impacts on society, in Portugal. RAIDEN Project © 2010 - 2013. All Rights Reserved.